What can I say about this when I first saw this in the morning? To my surprise, even one of my maternal aunts can recalled some of the names of these legends when she revealed that during her courtship days with my uncle - going to catch the team in action was a common thing in their "pak-tor" days! An appreciation that came rather late or what? Why do we need someone who is critically ill, so suddenly, to make all of us remember the joy and happiness they had brought to us more than 30 years ago?? 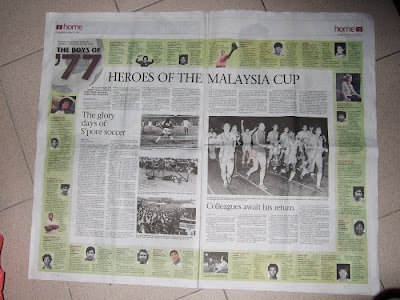 The details of those players who achieved "god-like" status in those days were detailed in this special report by The Sunday Times (above), when there's a sudden surge of interest on them following that unfortunate incident last week at Jalan Besar Stadium. Joining the rest of those who are concern of his well-being, let's once again wish Mr Dollah a speedy recovery. According to a source close to Mr Dollah Kassim, it reported that the legend nicknamed the "Gelek King" is making "slow but steady recovery" in his condition. Let's hope it's not too long before we see the man himself get back to his normal self. Will keep an update on Mr Dollah's condition, should I get hold of any instant information. I feel, one of the best (if not the best) ways, to glorify the '70s football days is to give better support the local football of today. In today's football, media play a big part as they affect $ponsorship and fans' support. If we did it before in the 70s (as many claimed), why can't we do it today? Some Gen Y and Gen Z people refuses to acknowledge the achievements of our past heroes. This is sad. They don't know the history yet they keep saying how we easily beat the state teams during the Malaysia Cup days. Their ignorance of the past makes them succumb to the failure of present. It's the sad thing that whenever I think of Mr Dollah in recent days, I can't help but recall that bitter incident took place at the "official closing ceremony" when the "Gelek King" himself was subjected to some rude treatments by some ignorant brats. If somehow or rather, these legends were made known and appreciated ever after they retired from playing that sad incident wouldn't have take place at all! As I reiterated it's sad and bitter to have an unfortunate incident like that to re-ignite that nostalgic feeling.. 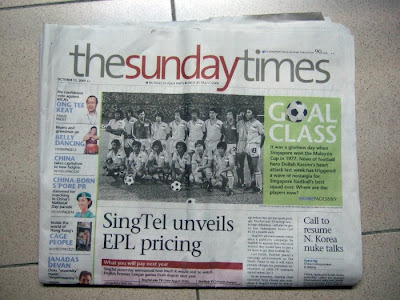 I hope mayor nordin will work on wif the media to publish at least one page of sleague in TNP everydae.It realli hurts me when ppl sae "juz close dwn sleague".. its our own sporean's league. They were part of the team that during MBT era of 'co-operation' & wht type of co-operation did they do.